Is it Jade or New Jade? It can be tough to recognize real jade from imitation jade, and these days, imitation jade is everywhere. One of the reasons it is so easy to pass off other minerals as jade is that jade itself comes in so many different colors and patterns, and can appear quite diverse. As such, there are many different minerals which resemble some form of jade or other. Some of these include New Zealand Greenstone, prehnite, aventurine (a type of quartz), grossular garnet, chrysoprase (also called Australian Jade), Malaysia Jade and Mountain Jade (a type of marble). The most common type of imitation jade is serpentine, which is also known as New Jade. Jade itself (real jade) actually refers to two different metamorphic rocks composed of silicate minerals. These are called nephrite and jadeite (seen to the right). How can you figure out if you actually have jade or if you’re looking at New Jade (or another substance) which is being passed off as jadeite or nephrite? First, familiarize yourself with the other minerals that are often passed off as jade. If you can learn to recognize their common manifestations, you can narrow it down based on the appearance of the stone you have. Hold up the stone you have to a bright light and try to look through it. 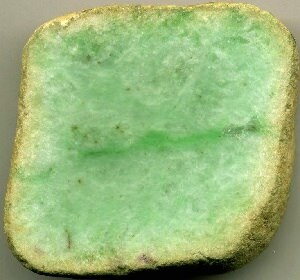 Jadeite and nephrite have a fibrous structure. If you can observe the fibrous structure (assuming the piece you have is not totally opaque), it is probably real jade. If it looks homogeneous, it is less likely to be real jade. Sometimes you will also see what looks like ‘layers’ of stone. This typically means you have a layer of jadeite over top of some other substance. Also look for air bubbles; real jade should not feature these inclusions. Jade seems to take longer to warm up in your hand than other stones. If yours takes a while to warm up when you are holding it, it is more likely real. Jade is denser than many other rocks. If you have other comparably sized rocks, try to determine whether the jade seems heavier. If it does, it may be real jadeite or nephrite. You can perform a scratch test to determine whether you have real jade, but it is better to avoid this in case your real jade is nephrite. Nephrite is soft and can be damaged when you try to scratch it against another surface. Jadeite on the other hand is quite hard and can scratch metal or glass. This test also does nothing to prove whether you have real jade (though it may narrow it down). A couple of imitation jade stones are very hard, just like jadeite. These include prehnite and quartz. How important is it that your jade is real jade? Obviously if you are a collector or a shop operator, you should know what you are exhibiting or selling. If you prize jade for personal reasons and want to be sure you have real jadeite or nephrite, than you would want to consider investigating any pieces you are unsure of to see what you really have. Particularly since New Jade and other jade imitation stones are becoming more and more common. Serpentine and other stones which mimic the appearance of jade can be equally beautiful, but they are often cheaper. If you are in the market for jade, you will want to be sure you are buying the real thing if you are paying the high price. Always ask for a certificate of authentication from a lab if you are making a valuable purchase.